Space is filled with smugglers. People who live on the fringes of civilized society, making their money by trading and selling items that are…less than legal. Except sometimes you make a back alley deal with a corrupt government, and all of a sudden you’re wrapped up in a web of conspiracies that might just ignite a war between every habitable planet in the galaxy. 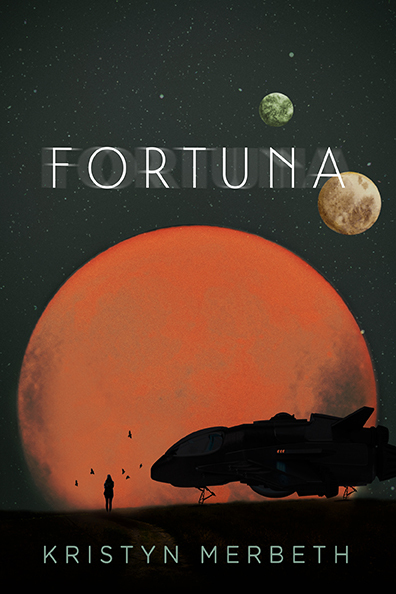 That’s where Scorpia Kaiser finds herself in Kristyn Merbeth’s new space opera, FORTUNA. It’s epic in scope, and tells the story of a family of smugglers who are in way over their heads. If they can’t save the galaxy, (and how can they when they can barely get along?) then humanity may be headed for a war that will not end well. Check out the striking cover below. The stars are her destination. The first book in a fast-paced space opera trilogy where a young woman leads a family of smugglers who become unwittingly involved in a galactic war. There’s only one thing Scorpia Kaiser wants in the whole galaxy: to finally own Fortuna, the ship she pilots and the only home she’s ever known. But when it becomes clear her predecessor – the family matriarch – has been secretly dealing with various planetary governments, Scorpia realizes that her own family may be the reason the system’s five planets are headed toward a devastating war. Lies, manipulation, and profit are all she’s ever been taught, but as she ascends into her new position, Scorpia finds she has the chance to change everything. Yet even as she takes on more responsibility for the family’s fate, fortune and influence, she is not at all sure she’s ready for it – even worse, she may not have the support of her crew, particularly her brother and rival, Corvus. To stop the war, she’ll have to unite her family and unravel the chaos they’ve left in their wake. Fortuna publishes in Fall 2019.